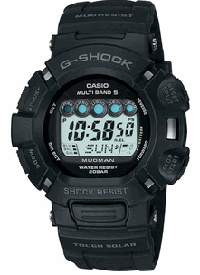 This Casio the Men’s GW9000A-1 G-Shock Mudman Solar Atomic Watch clay figurine series watch, anti-mud, shockproof, waterproof, resistant to low temperature of minus 20 degrees. Resin Case strap, dial diameter 46mm, 200m waterproof, 5 Bureau of radio receiver school, although they can not receive domestic Shangqiu station signal, but in remote areas in addition to the Northwest, the other most areas can receive radio signals in Japan automatically when. Solar charging system also has 29 time zones (48 cities), city code display, automatic electronic fluorescent lighting, 5 independent alarms, automatic calendar, battery indicator, night display function.